German authorities have heightened security measures following a series of attacks in public places over the past year. 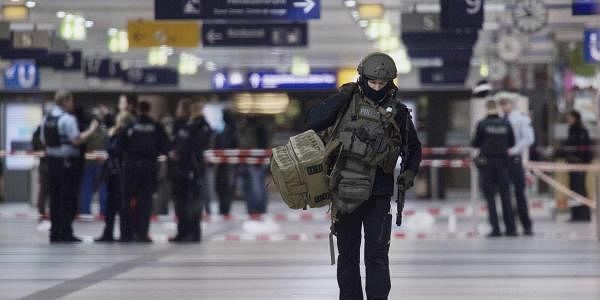 BERLIN: A man was arrested after injuring seven people with an ax at the main train station in Duesseldorf, Germany in what appeared to be a random attack, police said Thursday. Officers were alerted about an attack shortly before 9 p.m. (2000 GMT), prompting a large-scale police response. "A person, probably armed with an ax, attacked people at random," police said in a statement. Seven people were injured, three of them seriously, they said. The suspected attacker was arrested after jumping off an overpass near the train station, the statement said. The 36-year-old man, described as being from "the former Yugoslavia" and living in the nearby city of Wuppertal, suffered serious injuries and was being treated in a hospital. "The suspect appears to have had psychological problems," police said. An ax was recovered and officers were searching the area in and around the station, which was closed for the investigation. Police withdrew an earlier report that a second person had been arrested, saying later that they were working on the assumption the man had acted alone. In one attack last July, a 17-year-old Afghan asylum-seeker traveling on a train near Wuerzburg injured five people with an ax and a knife before being shot dead by police. The attack was later claimed by the Islamic State group.